*Stooopppp! Let me IN! * screeched a mental voice. The glider whooped a warning to others, jerked still, deployed the landing brackets, and rocked back and forth on them. *Windooww! * yelled something. Tiana turned toward the sound and jolted as something dark and furry showed beyond the tinted window. The spell took hold, and the furry animal bolted through, landing close to her. She put out a hand to keep the cat from tumbling onto her and thought she saw drool or spittle flying toward her, too. Tiana stared at the brindled cat of drab shades of brown and gray. One of his ears was half gone. Obviously not a pampered Fam, but a feral. He smiled ingratiatingly, showing a broken fang, too, and then his loud and rumbling purr filled the glider. Her heart thudded and her mouth dried. That was true. *You are not the Healer who lives there and who has a raccoon Fam. * The tom lifted a paw and flicked it as if dismissing such a creature. But Tiana’s sister’s Fam was young and pretty, especially compared to this one. So was everyone else’s Fam. Well, he had no doubt about that. “We are now ten minutes late to the appointment,” the mechanical voice of the glider said. “Oh! Resume driving!” Tiana ordered. But in went the claws and Tiana bit her lip as she watched the cat knead, but when he pulled out his claws, his whiskers turned down at no holes in the leather. A very good trick. I guess I should have posted here EARLIER that I am at Mile Hi Con this weekend (as usual, I've been going since before I got published, since before I started seriously writing, even). I have a 1pm panel, Ask The Authors, and a 4 pm panel Suspending Disbelief (reminds me I'm moderating those and I have questions fine for Ask the authors but not Suspending Disbelief so I need to look at those...) Come by and visit me. 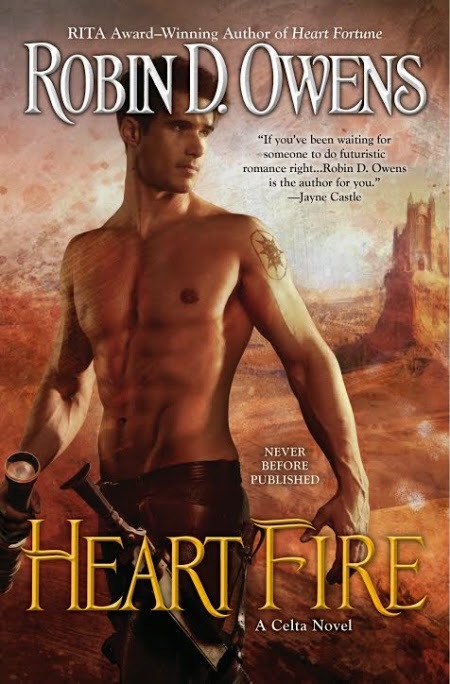 I have hardcopy ARCs of Heart Fire with me. The priestess was late. Annoyingly unprofessional. Antenn Blackthorn-Moss wanted to pace the flagstoned sidewalk in front of his business, a nicely elegant building with tall rectangular windows set in rough-cut red sandstone that he’d recently redesigned and rehabbed. But he couldn’t show his impatience or tension because his client, a Chief Minister of the Intersection of Hope, a stocky man but with an innate elegance, remained serene. Antenn couldn’t even look at his wrist timer, though his preliminary engineering crew awaited them at the building site, a dusty piece of land at the edge of the Varga Plateau, the geographic area Druida City was built on. His forewoman knew what to do, so hopefully they had started without them. Finally a glider stopped near them and the door rose. A woman gathered a formal robe and stepped out before Antenn could take the couple of paces to offer his arm. When she turned to them, her face seemed flushed with irritation, which immediately annoyed him. THEY were the ones waiting on her . . . but his frustration simply dropped away as he got a good look at her. She’d made an attempt to tame curly brown-black hair by putting it in a bun that might have once been smoothly elegant, but tendrils wisped in fine strands around her oval face. As she’d exited the vehicle, the fabric of her gown had tightened here and there and he’d seen she was slender but with nice, and nicely proportioned, breasts and hips. Her fine-boned features eased into a standard priestess pleasant expression. Elegant, dainty. Out of his league. And exasperatingly late. The priestess’s emerald eyes flickered and Antenn guessed that the Powers-That-Were in the Temple hierarchy had put pressure on her. Yet her manner held the strength and serenity of most priests and priestesses he’d met, along with steely determination. Spent the am at the Chihuly Exhibit in the Denver Botanic Gardens with Mom. Wonderful! And really glad because now it's clouding over. Well, I'm fretting a little. The fabulous Rose Beetem worked on my page proofs (galleys) for me for Ghost Killer despite her crazy schedule for Mile Hi Con this weekend, I worked a little on it, then sent it off last night. THEN remembered I had to check on a scientific fact (which they got WRONG on Forever last night). So as soon as I remembered I went through the pages, caught another comment I didn't see by Rose, and now I'm just hoping the fact is fixed. *You don't speak Fam properly,* the young fox whisked it's tail at Cordata as she sat, nearly defeated, on the park bench just inside of the south gate of Druida City. She'd just had enough energy and money – gilt – to get this far. How she was going to obtain any more was a question. Her spine straightened so she sat properly as her G'Auntie had taught her as a child. Her chin lifted as she stared the gray fox in its light yellow eyes. Unlike the rest of her Family, except that G'Auntie, she'd wanted to drift away from the grift and the con and better herself. Who knew it took so much more work to be honest? More gilt, too. She was broke. *Are you going to speak to me and take me as your Fam or not? * The thing hopped onto her bench walked across her knees insolently waving her tail in Cordata's face – yes, she noticed the femaleness of it – tickling Coradata's nose and making her sneeze at the scent of fox and road dust. *Greet you, fox-ling,* Yeah – yes – her mind accent was broken, but she wasn't accustomed to talking to anyone telepathically. One of her prospects – a strong, wild Flair she'd need to tame. Note: I spend a lot of time on Facebook, but I know you all might not be there, so I will be posting more of what I do there, here. 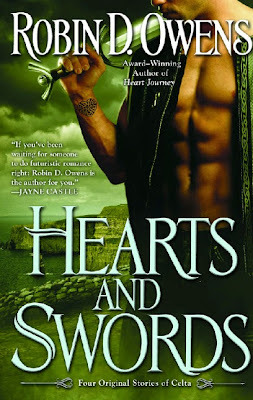 I THINK this blog feeds into my amazon page, where you might be able to read it, and to my goodreads page. Celta Thursday! 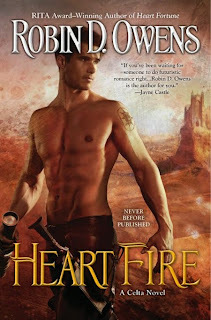 Heart Fire excerpt, the Turquoise House! Coming November 4! The Turquoise House hummed to himself, happy with his existence as much as he’d ever been since his HeartStones had wisped into awareness twenty-two years ago. The tune wafting through his walls was one of the latest that Trif Winterberry had composed for him. He was beloved of the FirstFamilies and had had many wonderful guests. But he was impatient and it was time to gather in his Family. He was no longer an adolescent, but a mature adult. He was wealthy from his leases and the belongings his previous Family had gathered over two and a half centuries, but most of all, he was beautiful, with a gorgeous, shiny light turquoise exterior. No one, not even the person he’d been luring and who had not come back, could resist him now. And TQ was brilliant. He’d set his plans. Soon he would have his Family, and everything would be perfect. 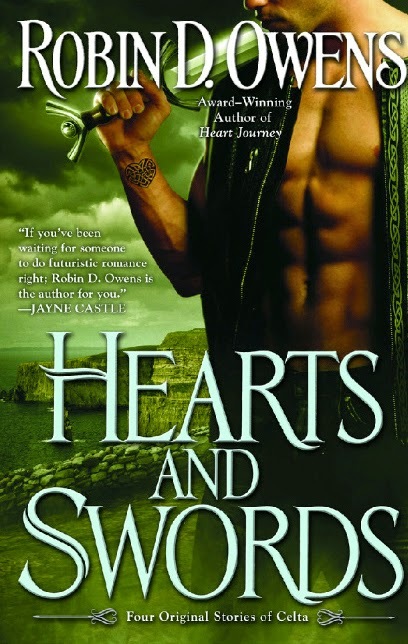 Yes, for the first time ever I have a different Point of View than the hero or heroine in a Celta HeartMate book! The intelligent house, the Turquoise House. Enjoy. Celta Thursday. You might have seen the intro of Tiana in Heart Fire before, but here's a bit again: “I know you desire my position, dear,” the High Priestess of GreatCircle Temple, the main priestess on the planet, said to Tiana Mugwort. Tiana stumbled over a small rock in the meditation path. Her mentor’s comment caught her off guard. She’d been concentrating on keeping her new, expensive, and white formal robe from catching on some of the twiggy bushes along the trail instead of watching where she was going. “Most FirstLevel Priestesses would be honored to have your position,” she said. No help for it, she’d have to use psi power, Flair, to coat her gown. She’d anticipated this career review would take place in an office instead of one of the winding paths near GreatCircle Temple. With a huge, hopefully discreet breath, she used nearly the last of her Flair to protect her robe for a half septhour. Surely that would be enough. She’d spent her psi energy recklessly this morning with several teleportations before the meeting. She’d thought there’d be tea and flatsweets. Instead she needed to catch up, both on the path and with the conversation. Of course she shouldn’t have expected her own ambition to become the High Priestess—no matter how masked behind a quiet manner—to have been overlooked by the savvy woman. 5 book bundle for 99 cents! Again my apologies for this being late due to Jury Duty. "Scry bowl, voice only, call D'Ash," Ailim commanded. Swearing came across the link, a holo showing intertwined bodies. "Holo off!" said T'Ash. His voice was followed by a lighter one. "D'Ash here." "D'SilverFir, my Fam is ill."
"Stones don't have these sorts of emergencies," grumbled T'Ash and almost made Ailim smile through her anxiety. "Can she still speak to you?" asked D'Ash. "Not too terrible, then. I'll teleport to D'SilverFir Residence within the next quarter septhour," D'Ash said and ended the call. Ailim ignored her aunt's protest and dressed hurriedly in a soft tunic and trous suit of teal that came to hand. Though it was one of the days she sat in Judgment Grove, a dark purple robe would cover what she wore. With a quick spell, her hair was intricately arranged in braids. She picked up Primrose. The pup felt hot and her little tongue flopped out of her mouth. "You'll eat what D'Ash says, and nothing more. And I agree, there's no difference in taste in no-time dishes, unless it's that we could afford a good pastry chef during the era of the generations ago D'SilverFir. Ignoring no-time stocks while preparing fresh is only Whitey's foolishness, a stupid Noble custom to make us more exclusive. Donax was right in indexing the no-time larders, and in recommending we use what we have," she muttered, petting Primrose and hurrying down to the breakfast nook set in the curve of one of the towers. A glass table was set with the best china and held a three-tiered set of platters heaped with mouth-watering sticky-buns, scones, rolls, cakes and filled croissants. *Yum,* Primrose said weakly, eyeing the bounty. "No." Ailim set her Fam down on a cushioned chair and poured herself a cup of caff. "D'Ash arrives," said the mellow tones of the Residence. Ailim looked out the arched window that faced the lake and the drawbridge, but couldn't see beyond the trees of the estate to the great greeniron gates. "D'Ash here," said a breathless, cheerful voice, transmitted by the resonating stone embedded in the wall by the gates. She looked as optimistic as she sounded and relief lightened Ailim's heart. "Come," Ailim teleported the GreatLady to the nook. D'Ash examined Primrose. "What we have here is a puppy who has been eating well, but not too wisely. No doubt taking advantage of the banquet yesterday, the Ritual foods, and all your fascinated relatives who'd slip her anything she begged for." Primrose opened her eyes very wide, tilted her head, flopped her ears and looked pathetic. It didn't soften Ailim's heart. "I'll make sure the family knows that she must strictly adhere to her diet." "Cousin Canadena will have to stop feeding you. You can't visit her kitten if she's going to ignore my orders," Ailim said. D'Ash stroked the long hair falling over the Fam's eyes. "I can heal her, but using such Flair on a bellyache is a little overmuch. If you'll let me, I'll take her with me, treat her with a bit of herbs and spells, and return her later in the morning." "I'm in Judgment this morning." "I've always wanted to take a look at Judgment Grove when something interesting is going on. Now that I make my own schedule, I can." D'Ash unfolded a carrier bed lined with fluffy CottonSorbaroot and carefully placed Primrose in it. The animal healer touched a finger to Primrose's head. "Sleep, and feel no pain." Primrose's body settled limply into the bed. "She will be fine in a few hours," D'Ash said, pouring herself some t'caff and reaching for a cocoa-filled croissant. "Oh, these are delicious. For my fee, could I take them all?" "I owe you more than that." The GreatLady raised green-hazel eyes, and Ailim saw a wealth of compassion. A flush of embarrassment at her Family's lack of funds heated her neck. "As T'Ash says, we are GreatLords, what we choose to set as our fee is completely up to us. His Fam, Zanth, has a habit of terrorizing our chef. A terrorized chef doesn't have a very light hand with pastries." Danith sighed. "And we all have a taste for sweets." "The pastries are yours, then." D'Ash glanced at the puppy. "I'd better be going. I'll be at the Judgment Grove at mid-morning bell. See you later, D'SilverFir." D'Ash expanded a visible sphere of Flair around her, the pastries on the table, and Primrose. "Call me Ailim, and my most heartfelt thanks. Merry meet." "And merry meet again," Ailim said, just before D'Ash winked out.